As you probably know, Google Drive is far more than a place to store files online. It also includes a suite of versatile creation tools, many of which perform the same functions as the ones we use in other spaces. These include Google Docs, a word processing program that behaves similarly to Microsoft Word, Google Slides, a presentation program similar to PowerPoint, and Google Forms, a survey-creation tool similar to Survey Monkey. Although Drive also includes other tools, these three are particularly useful for creating rigorous, academically robust projects. If your school uses Google Classroom or at least gives students access to Google Drive, your students are probably already using these tools to write papers or create slideshow presentations, but there are other projects they could be doing that you may not have thought of. 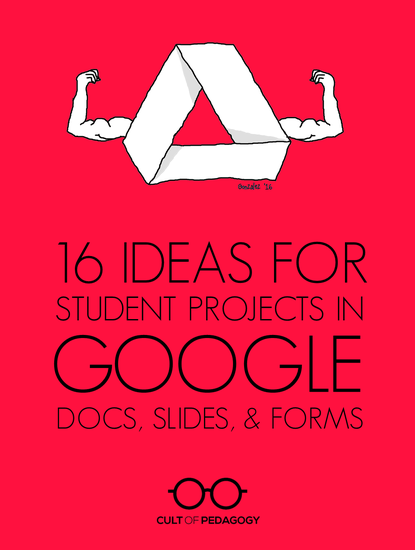 Click HERE to access 16 great ideas for projects using Google Docs, Slides, and Forms. 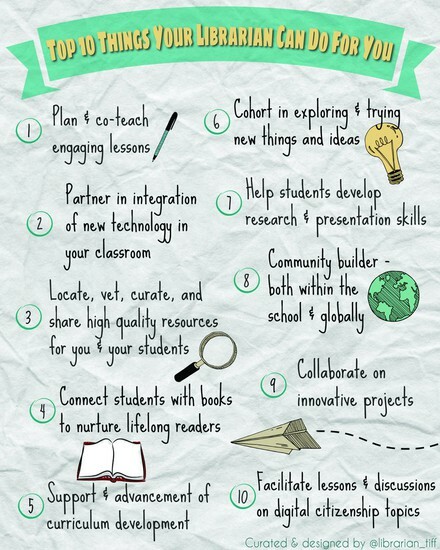 "16 Ideas For Student Projects Using Google Docs, Slides, And Forms". Cult of Pedagogy. N. p., 2016. Web. 16 Sept. 2016. Google Forms is a great platform for creating all kinds of simple quiz and review activities. One of the features of Google Forms that is often overlooked is the "go to section based on answer" setting. When you use that setting correctly you can send students to watch a review video when they answer a question incorrectly in your Form. In the five minute video embedded below I demonstrate how to create a Google Form that prompts students to watch review videos when they answer questions incorrectly. Read more on Richard Byrne's Blog HERE. Forms, How. "How To Include Video Feedback In Google Forms".Freetech4teachers.com. N. p., 2016. Web. 16 Sept. 2016. You can use Google Forms to create a lesson planner that creates documents — automatically! — with all your plans in a format nicely designed by you! Invest a bit of time now (I’m guessing +/- 30 minutes … just my best guess) and you’ll have a system that saves your lesson plans to your Drive that you can find easily later. You’ll create a Google Form like this one (click here) where you’ll type up your lesson plans. For step by step directions on how to use Google Forms to create lesson plan documents automatically click HERE. 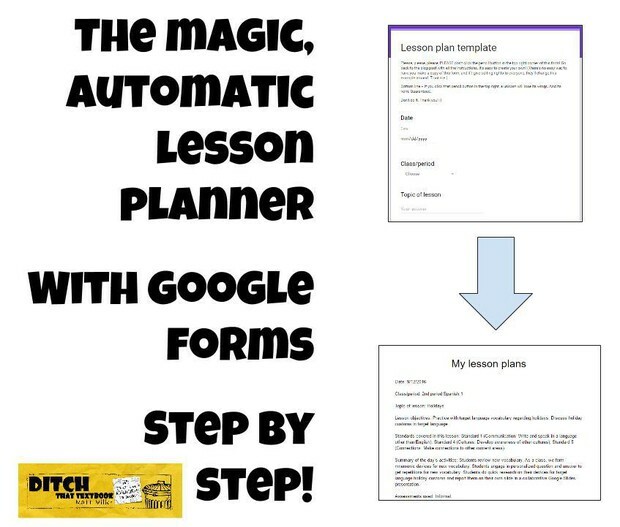 "The Magic Automatic Lesson Planner With Google Forms". Ditch That Textbook. N. p., 2016. Web. 16 Sept. 2016. The JCHS Library is ready and able to assist with the migration to using Google. We offer one on one, small group and co teaching (to help your kids learn the new system) opportunities for this and all technology related interests. 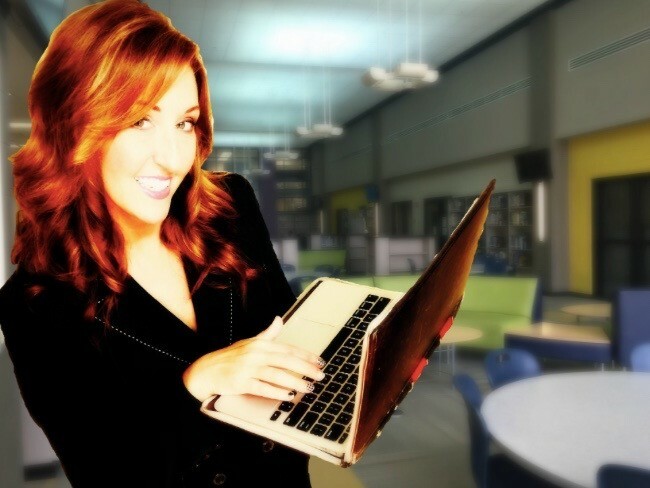 We can come to your classroom or the Harvard Room can be reserved. "Mighty Little Librarian | Librarian Tiff's Blog". Mightylittlelibrarian.com. N. p., 2016. Web. 16 Sept. 2016.